mantra | Hari Sarvothama! Vayu Jeevothama! Sri Bhavabodakaru Educational Trust and Sri Uttaradi Math, Chennai invites you all to participate in Koti Gayathri Japa Yagna and Sri Krishna Mantra Japa at Dharmarakash Hall, Chennai on 16-Mar and 17-Mar in the divine presence of Sri Sri Satyatma Theertha Swamiji. Please click on the image below to view the invitation. 11-Apr-17 marks the beginning of auspicious Vaishaka Snana. Vaishaka Snana starts from Chaitra Shudda Hunnime to Vaishaka Shudda Hunnime. Here is an opportunity to get rid of all sins and people who undertake baths in the tirthas at such holy times(early morning before sunrise) get immense benefits. 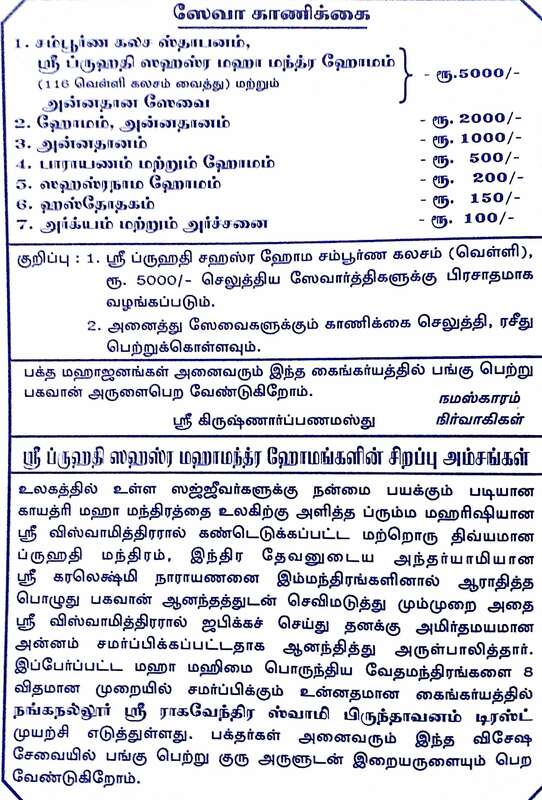 Giving Udukumba Dhanam during month is advised. The auspicious Dhanurmasa is starting on 16-Dec-16. 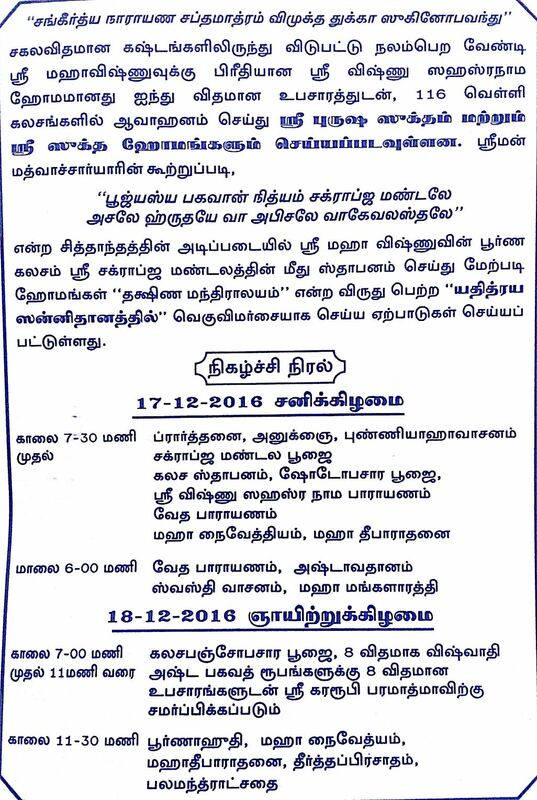 Sri Raghavendra Swamy Brindavanam Trust, Nanganallur is planning to conduct Bruhati Sahasra Maha Mantra Homa and Sri Maha Vishnu Sahasrananama Homa on 17th and 18-Dec-2016(Sat,Sun). Please find more details below. If you look back at the last two decades, we could identify very few events that are game changers. 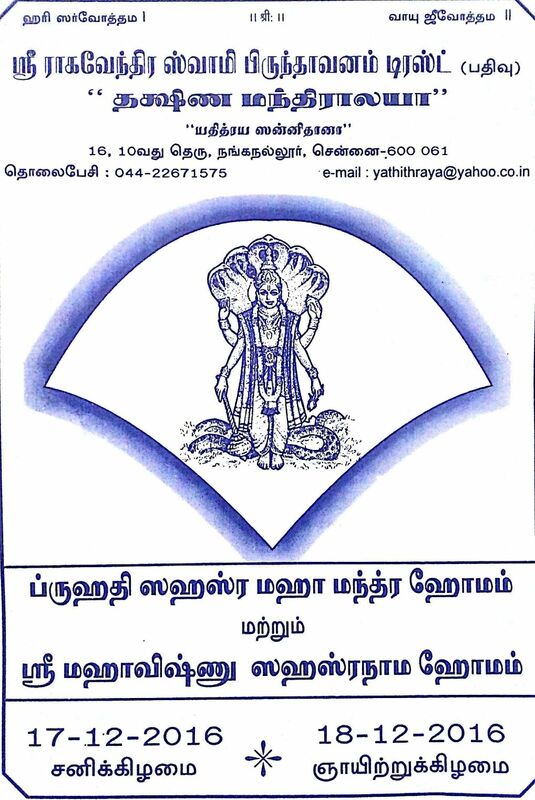 I am sure you will all agree in the first decade our monthly Tamil magazines like Tathva Vaadha and Sri Sudha made a lot of impact in TN in our everyday lives and they were very much responsible for increasing the level of adhyatma awareness on our Dvaita philosophy, Acharyaru, Achara and Anushtana. In fact today we see many madhwa homes are following various daily practices and procedures religiously, the credit goes to these magazines and their editors, who due to their tireless efforts, have built the awakening and ensured we start adhering to what is said in the shastras and gradually move forward. In the current decade, if you look at one movement that made lot of impact and created a lasting impression, it is none other than the LHVS initiative. This samiti was started way back in the year 2010 in a humble way with a small group of enthusiastic devotees in Chennai Madipakkam and today have reached phenomenal heights and impacted everyone all over India from halli till Delhi. Their honest and simple concept of “mane mane Vayustuthi parayana” has attracted one and all and today the samiti / LHVMSPS trust have expanded in many ways and doing a lot to our madhwa society in terms of coming up with spiritual books, educational, medical and marriage assistance to the deserving folks, while continuing the sacred mantra parayana week after week, day after day. In this year they have come up with a new Sankalpa of chanting the powerful and sacred Yanthrodharaka Hanumath Stotra by Sri Sri Vyasarajaru ONE CRORE Times (Eka Kotee Yanthrodharaka Hanumath Stotra Japa) for Lokakshema. Samiti invites you all to join this auspicious endeavor and looking forward to have you all on board. All they request you is just to register yourself and start chanting this divine YHS stotra and share your count. Please register yourselves at once and let your friends know about this and let us all get our hands together and be part of this transcendent journey and get the blessings of Sri Hari Vayu Gurugalu. All details like contacts and steps for registration can be found in the following link. The auspicious Maagha Snaana starts from 24-Jan-2016(Sunday). It is a very auspicious month. Whole month early morning snaana is very important. 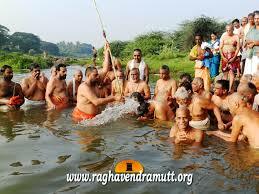 This bath is very potent and can fetch a lot of benefits. It is best if the bath is completed before sunrise, when the stars are still twinkling, medium if it happens after the stars have vanished, and inferior if sun has risen. Let us all join together and perform this holy maagha snaana to cleanse ourselves of our sins and enhance our merits. After performing snana chanting this above mantra, One should give arghya to Madhava chanting the below mantra. Sacred texts like Vayu Purana, Brahmaanda Purana are said to have made reference to the merits and significance of Maagha Snaana. They say that when you take the Maagha Snana or bath in the sea or ocean (Samudra) its is considered more meritorious than everything else. 04-Apr-15 marks the beginning of auspicious Vaishaka Snana. Vaishaka Snana starts from Chaitra Shudda Hunnime to Vaishaka Shudda Hunnime. 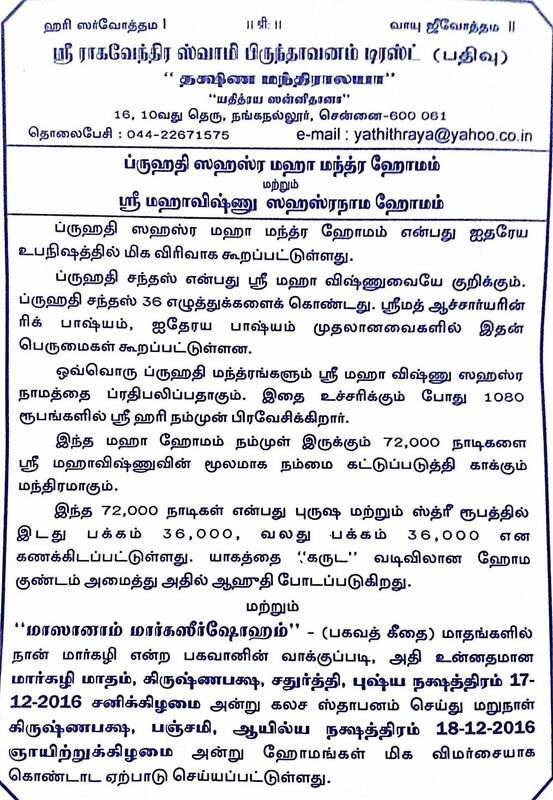 Here is an opportunity to get rid of all sins and people who undertake baths in the tirthas at such holy times(early morning before sunrise) get immense benefits.